No cheese or chocolate, despite the name! These delicious, crispy, flavour packed spuds are a way to fancy up any dish, and aren’t that hard to make! Choose potatoes that are best suited to roasting, as these brown up and crisp beautifully. 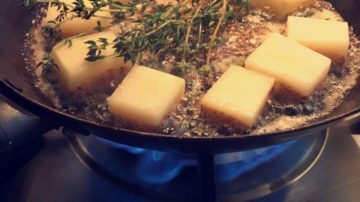 In this recipe, I mention a heavy set oven proof pan – don’t worry though, if you don’t have a pan that is suitable for the oven, transfer the potatoes using tongs to a roasting dish and pour the liquid and herbs over. We’ve served mini fondant potatoes with chicken, lamb, beef and turkey dishes, as well as made a classic Sunday roast a little fancier with these, it’s pretty easy and a great way to show off your cooking skills for guests!